May 21, 2018 baby, children, health. 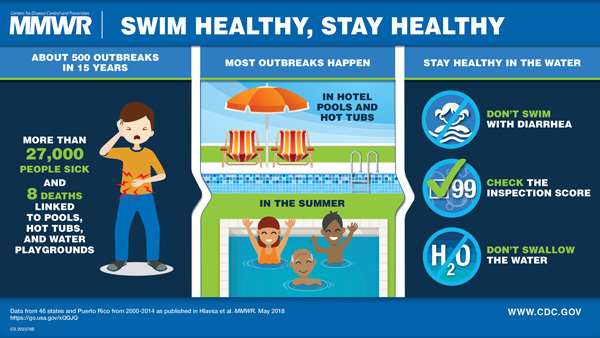 1 in 3 waterborne disease outbreaks traced happen in hotel pools or hot tubs. There have been about 500 waterborne disease outbreaks from 2000 to 2014. In addition to hotel pools and hot tubs, water parks have also been to blame. Diseases include things like Cryptosporidium, Pseudomonas, and Legionella. These diseases are also really tough to fight. Crypto can survive in even properly maintained pools and pseudomonas and legionella can survive disinfectants. In the 493 outbreaks from 2000 to 2014, 27,219 people got sick and eight people died. More than half of them happened in the summer. These disease cause things like skin infections, respiratory disease and diarrhea. Austin had its own Crypto outbreak in 1998, when 1,300 people got sick. Healthy and Safe Swimming Week begins Monday. CDC encourages swimmers to help protect themselves, family and friends from germs and encourages the aquatics sector to follow recommendations for the design, construction, operation, and management of recreational water facilities. For more information and other healthy and safe swimming steps, visit www.cdc.gov/healthywater/swimming. RELATED: How safe is your local pool? Before you head out, read our research.